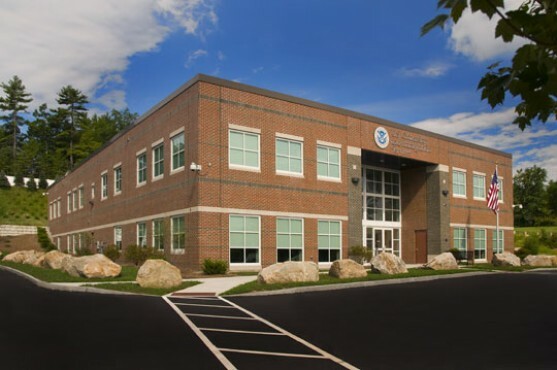 Contracted by the General Services Administration this is a new two story, 21,500 SF building to house regional offices for multiple agencies serving immigration and naturalization functions. The building’s image was to be both inviting yet reflect a degree of formality and respect for the functions within. The 2 story receiving lobby gives a strong initial impression and allows the upper level waiting spaces to visually connect and orient visitors back to that main entrance. The facility has secure access through screening stations at its main entrance. It is obviously necessary to be secure yet equally desirable to make it appear as friendly as possible as the public portal to the various agencies. There is a strong separation between the public and private office functions within this building. Working with the construction management team and the consulting engineers we developed an efficient envelope for the building and were able to select and implement systems and features that achieved a LEED Silver certification by the US Green Building Council.